Seven minutes went up on the fourth official's board last night and the father - on the terrace he always stands in St Conleth's Park, and half-empty as it always is - turned to an old woman beside him. “Fresh flowers only, please,” he announced as it was one of those glorious and terrifying and wonderful moments when a sport takes complete hold of every nerve and sinew. Of course the greater purpose of his utterance was beyond humour, in that it might relieve the escalating blood pressure and bring down the heart rate. Moments later he took off out onto the field with the dash of a younger man. Pride of place. Sweet, sweet pride of place. That's what the GAA leadership falsely advertises when it sticks its corporate product on the shelf and says pay up. But to think they actually tried to stop this and will stop it going forward. It's a huge indictment of what they've become and it shouldn't be forgotten. However that is also why this game and this result were seminal moments in the season, and maybe for a long time to come. Whatever the result of this, the arm-wrestle all week was about a beginning rather than an end when it comes to trying to push for a new era. But people are flaky these days. Too lazy to pull back the curtain and to step back and see the bigger picture. Thus the real fear was that defeat for Cian O'Neill's team would unleash a predictable and smarmy and smug wave of comments. All of those sentiments would have spectacularly missed the point yet still they'd have taken hold and ownership of the situation. The reality though was this was about rising up against the idea and practice of elitism in what was supposed to be a ground-up volunteer organisation; this was about standing up to the baseless bullying and threats from on high; this was about taking back what's yours from those who can't see what's going on such is the angle of their noses. We'd offer a penny for their thoughts, but we know the hierarchy don't deal in such small sums. Let's be clear here, a lot of people owe an apology at the very least after their words and their actions across the incredible week that was. Nickey Brennan had the ego to suggest Kildare “made their point, now get on with it,” with the venue still set as Croke Park, but his out is that he's no longer involved. Others are though, the same folk with a hand tightly grasping the tiller. Feargal McGill, the director of games development, who threatened one of the units of the organisation with expulsion for following the rules, only to have his bluff brutally called. Alan Milton, their communications director, who stated the switch to Conleth's Park was down to “a whole new set of circumstances” when this is false as the Kildare County Board went to the Gardaí immediately after the draw and informed the CCCC of exactly what the sergeant they dealt with said. They, and as a result Croke Park, were told Gardaí had the resources to cater for what was needed as long as the game was at 7pm and nothing ever changed in that regard. Ned Quinn, head of the CCCC, who insulted fans by hinting at violence due to limited capacity. It was staggering ineptitude all round and, as the mask slipped, it was more ugly than we imagined. The funny part was that none of them could get their story straight as it veered from being about people getting to see it – this from a GAA that avoided Congress to make sure they could sign a deal with Sky – to concern about those outside the gates when their own Slattery Report and the local authorities promised it would be fine. In the end there was no bloodbath. Remarkable. In a way, it's a good thing this all happened in the build up as anger needs a focal point, just as the knife needs a sharp and shiny edge. That's what this was and why so many with no vested interest still took a massive interest for they'd witnessed the pulling back of the GAA's fur coat to find there's nothing beneath. Bad direction is one thing, bad direction based on a bumbling cluelessness is far more humiliating. To lie to people one thing; to keep doing it when caught out is another. Ultimately this was a telling and important microcosm around why the grassroots feel such anger and why they ought to do something. By actually going against the GAA's judgment, look what we got and what does that tell you about the GAA's interests in all this? Newbridge had 19,000 in it in 2001 and the Kildare County Board's own independent health and safety report concluded that 11,000 was fine last night. But even with a little over 8,000 there it was a throwback to what originally made the qualifiers so good, and what used to make the championship great. A dash for tickets. A full house. A heaving atmosphere. Nirvana. Can you imagine had this been done the GAA way in a soulless Croke Park, all for a few more ticket sales? We've talked before about the obvious financial doping, but let's look at this in terms of the game alone, for venue fixing is vital. If you crunch the numbers, home advantage comes in at about four points. It's true that the alternative here wasn't an away game so that figure can be reduced, but what cannot be reduced is the idea that Kildare would have lost elsewhere. Thus the CCCC, by breaking their own bylaws, might well have interfered to the degree they changed the outcome. If you think it's coincidence that such interference tried to help a side that would have brought bigger audiences in terms of venues and television down the line, that's up to you. What isn't up to you though is that their attitude actually diminishes the integrity of the competition. That is staggering. But without being allowed to stick their neck where it should never have been, the result wasn't altered. And the local economy is said to have benefited by around €400,000. And that will make knocking on doors looking for money in darker months an awful lot easier. And some of that may be reinvested into the game. And Kildare's collective psyche got a serious boost. As did the summer. But doesn't every county deserve that lot? Don't they all put in enough effort and care and love to the point they shouldn't have it ripped away based on a bottom line when this is invaluable? And why is it the GAA want to deny them that? Sadly that's a rhetorical question. The one pity in all this is that it had to be Mayo, finally falling on their swords after so many cuts and wounds. They will be a loss, but the hope is that a summer walked away from is better than a summer that knocks them down, and that they can regroup and bring back what they've given year after year. 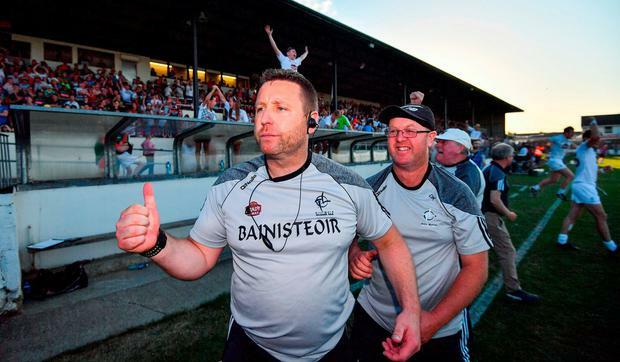 However even they knew this was about more that a game as during the week, three of their panel off the record said they absolutely agreed with Kildare's stance. Who didn't? Who possibly could? If this is the peasant's revolt, it now crucially allows us to ask what next. Dublin we know have two games in the qualifiers at home and it could be three if, ironically, Kildare beat Cork next. That's because unlike this round of the qualifiers, the rules state that the CCCC has ultimate control over all further fixtures and we know well the GAA will revert to its elitist type. That ought to be the next focal point, the next lightning rod, the next battle, as many deserve so much better. 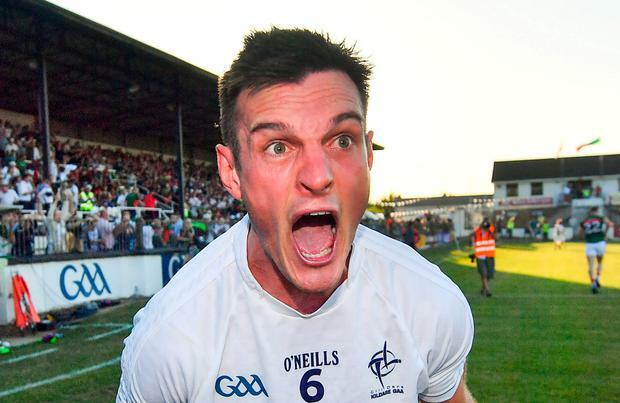 This wasn't just Kildare's night. And this isn't just Kildare's fight. A blow was struck but, ask yourself, is that all it is? Will you exchange a walk on part in the war for a lead role in a cage?